Waterline Environmental Inc. has been providing professional foundation underpinning services for over 30 years and is recognized by the Ministry of the Environment. All of our correspondence is with the homeowner and there is no government red tape! - Sinkholes, and other factors. Foundation underpinning can be completed through stabilizing the structure or the soil on which it rests. When a heating oil tank is removed and has failed, the contents can migrate under the house foundation. As these soils are higher than the allowable part per million (ppm) guideline, they must be removed. 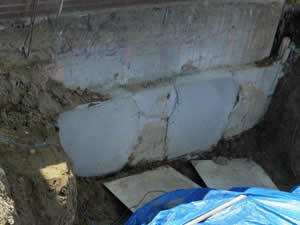 In order to remove them, foundation underpinning is often required. We will ensure that all of the necessary structure building permits are collected, organized, signed, and filed on your behalf. With Waterline on your side, you can remain as stress-free as possible during your foundation underpinning project. With Waterline Environmental, you'll have an engineering partner you can depend on to stabilize and secure your structure. We're here to answer your questions and to ease any concerns you have about the foundation underpinning process. We will analyze, diagnose, and provide a detailed explanation of our intended plan for your foundation-underpinning project. We'll keep you in the know, so you'll always know what we're doing and why we're doing it. Are you in need of professional underpinning service? Contact Waterline Environmental today to get started with a firm quote! We're here to protect you, your home, your family, and the environment.